Yesterday we posted about an article at The Independent on Donald Trump’s scheduled visit to Israel – Trump to visit controversial Jerusalem site, Israel PM Netanyahu, reports say, Dec. 11. We focused our attention on the decision by the journalist, Massoud Hayoun, to seek comment on the row from anti-Israel extremist Ali Abunimah. Following our post, we decided to tweet Hayoun and ask him why he thought that the views of an extremist like Abunimah were relevant in a row about Trump’s extremist position on US immigration. 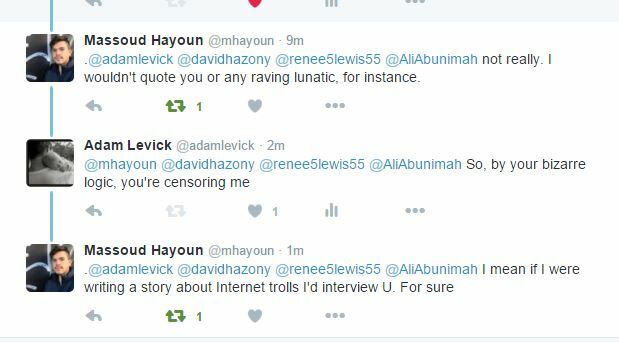 So, to recap: A journalist for one of Britain’s major dailies believes that Ali Abunimah is a credible voice on the issue of racism and that not interviewing Abunimah for his story would be “censorship”. 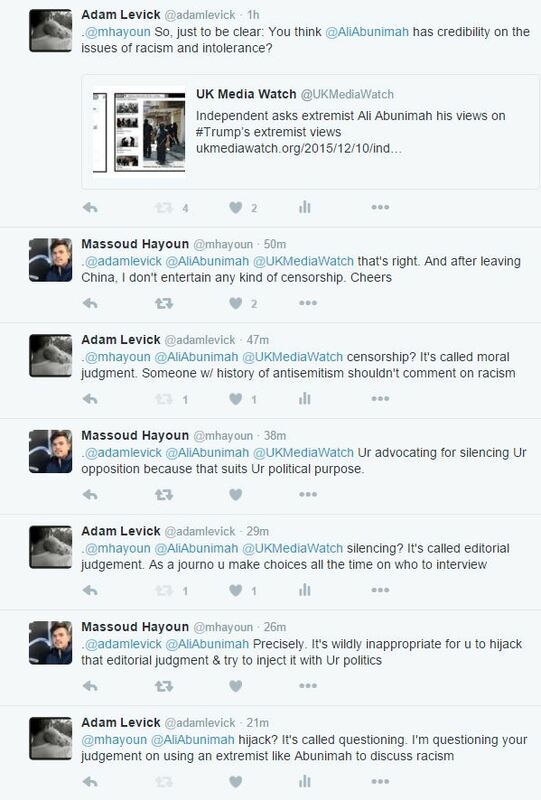 As my colleague Gilead Ini aptly observed in a tweet following the exchange, Hayoun intentionally confuses two journalistic concepts, “censorship” and “accountability,” so as to avoid the latter. They have their own language. Anti-Semitism, for example, isn’t a real word since Arabs are Semites. Terrorism is what happens when Israel shoots at missile launchers. And, of course, murdering Jews is a peace loving act, meant to end the Occupation which is defined as either Jews no longer in Gaza, or Jews employing Arabs in the West Bank, or Jews simply living freely on a swath of land the size of New Jersey which makes up about .01% of Middle Eastern territory. Desperate and crazy is the typical pro-Palestinian front. But don’t call them morons, because that’s censoring! Actually by blocking you he’s not really censoring you. He’s censoring himself from you. You can still read his tweets and comment on them. 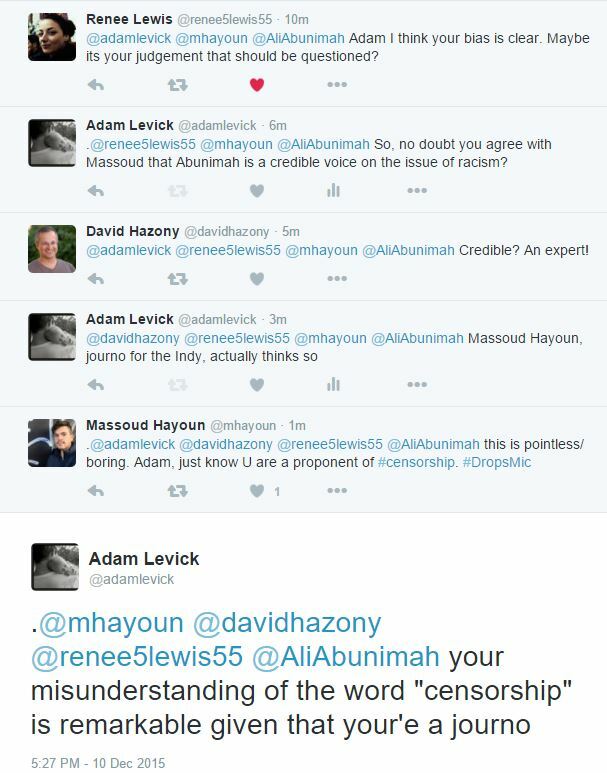 Massed Hayoun give us a lesson on journalism, islamo-fascist style. @mensfront: Interesting point of view that I hadn’t considered before. It’s rather like the little girl with her fingers in her ears shouting “Na na na na na” every time you say anything, so that she doesn’t have to hear you. Or, of course, admit that you have a point. Affirmative action has run amok at the Indy. How else to explain that this wretched excuse for a journalist is in its employ? His next tweets are interesting, accusing you of factual errors by calling him “he”. Apparently he doesn’t want to identify with any particular gender; may I therefore humbly suggest that you refer to Massoud as “it” from now on. Massoud Hayoun needs to visit the LGBT center in Fascist Iran or Gaza. I suspect it might be a one-way trip. Especially to the one in Gaza. Not a good performance was it? All Massoud had to say was ” Yes I think Ali is a credible voice on the subject of racism”. Yes, unsurprising that you would think a racist who supports the murder of Israelis is credible on racism. And the right of free speech does not encompass the right to be listened to. Mr. Hayoun has an interesting past, according to his entry on this website. For someone who joined “The Independent” a week or two ago perhaps he intends to start with a bang or just carry on his previous work at AlJazeera, CNN etc. how many people read the Indy ? Vanishingly few. Fewer this year than last year. Long may the trend continue.